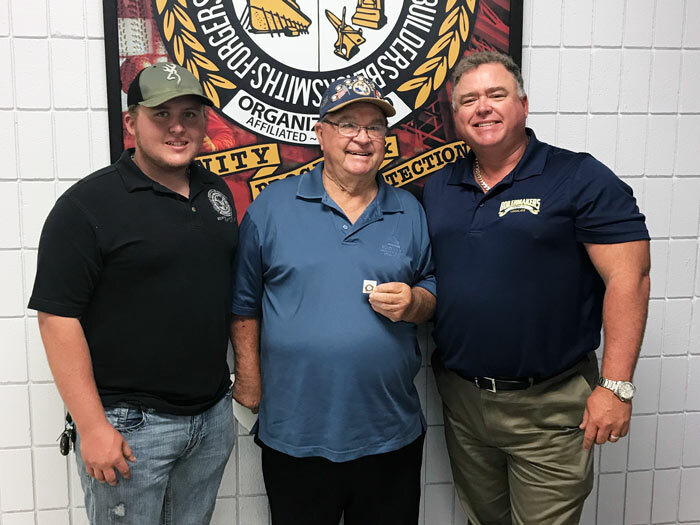 James Barnes Jr., BM-ST of Local 433 (Tampa, Florida), right, presents a 50-year pin to his father, James E. Barnes Sr., center. At left is BM-ST Barnes' son, James H. Barnes, a first-year apprentice. 25 YEARS — Paul Antczak, Michael Bressanelli, Eileen Conway-Gaynor, Brian Geiger, Michael Gonzalez, Jesus Izaguirre, Thomas Maher, Timothy Metcalfe, Robert Morrin, Jeffery Nelson, Ken Nona, Michael Phillips, Daron Webster. 15 YEARS — Sergei Bratkov, Kristin Grimshaw, Michael Harlan, Matthew Kaufman, Charles Lewis, Paul Lunsford, Warren Manion, Harold Murphy, Bobby Reed, Casey Smith, Daniel Westberg. 35 YEARS — Ezekiel Bain, Donnie L. Smith, Palmer Cox. 15 YEARS — Mathew J. 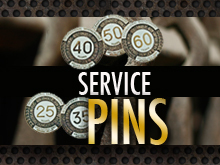 Backer, Curt R. Barthelemy, Cory C. Belden, Stacey J. Bendish, James A. Curtis, Jesse J. Jarmuzek, Oscar A. Machado, Michael S. Malles, Duane E. Oraskovich, John C. Peterson, Aaron M. Pfliger, Michael R. Prantner, Mick L. Pudney, Wade L. Puska, Lee D. Roth, Stacer L. Taylor, Brian L. Vinje.